Whaleback Lighthouse has the distinction of being the southernmost lighthouse in Maine. 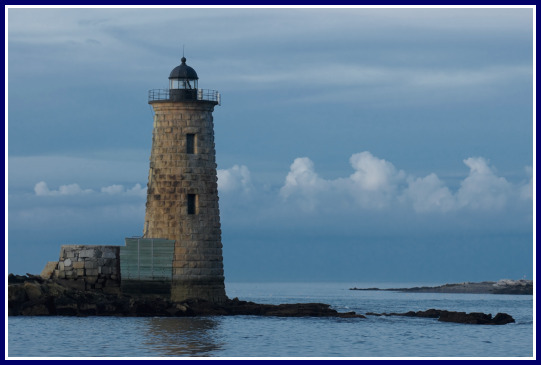 Though it guards the entrance to Portsmouth (New Hampshire) Harbor, right where the Piscataqua (Pis-CAT-ah-kwa) River meets the Atlantic Ocean, it just makes it over the border into Maine waters. President Andrew Jackson ordered that a lighthouse be built here, and the first one went into operation in 1830. That first structure managed to do its job for over 40 years, but during those years it leaked, shook, and fell apart a little bit more with each storm. Finally, a new lighthouse was erected right next to the old one in 1872. In 1880, what remained of the original tower was torn down. A blizzard eight years later took care of much of the rest of the original foundation. The lighthouse was automated in 1963. One of the unique things about this beacon is its proximity to the Wood Island Lifesaving Station. There are very few remaining lighthouse-lifesaving station complexes, and although empty now, this one is an excellent example. Note: The Wood Island Lifesaving Station is endangered. A group of concerned benefactors seeks to take ownership of this piece of New England maritime history and preserve it forever. To honor our Coast Guard and the incredible bravery of the New England men of the past who risked their lives solely to save the lives of others, I encourage you to help save Wood Island. The United States Lifesaving Service was established in 1871 to aid those in danger at sea. The sole purpose of a lifesaving station was to send men and boats out, usually smack in the middle of a horrifying storm, to save the lives of those whose ships were in distress. Their motto was “You have to go out, but you don't have to come back”. In 1915, the Lifesaving Service was merged with the U.S. Revenue Cutter Service and was re-named the United States Coast Guard. Isles of Shoals Steamship Company -- 315 Market Street, Portsmouth, NH 03801. Phone: 1-800-446-4620 or 1-603-431-5500. Email: customerservice@islesofshoals.com. Tugboat Alley Too -- 47 Bow Street, Portsmouth, NH 03801. Phone: 1-877-tug-alley (884-2553) or 1-603-430-9556. Captain & Patty's Piscataqua River Tour -- Kittery Point, ME. Phone: 1-207-439-8976 or 1-207-451-8156 (boat). Email: cappat@capandpatty.com. Harbor Adventures Kayak Tours -- P.O. Box 345, York Harbor, ME 03911. Email: harboradventures@aol.com.